Choose this one if you are NOT a KDOT Official. One of the efforts, the Kansas Aggregate Producers’ Association and the Kansas Ready Mixed Concrete Association strive for is a stronger partnership between our industry members and KDOT. For this purpose we invite you to attend a District Engineer’s Roundtable on Tuesday, November 17th at 10:00 AM at the Topeka Country Club. This roundtable will be a great way for our members, your material producers and KDOT to have helpful industry discussions, networking, and Q&A. We are also requesting that if you plan to attend to please send in questions ahead of time so that we can make sure they are thoroughly answered at the meeting. All questions should be emailed to Amanda Schuster at aschuster@kapa-krmca.org. 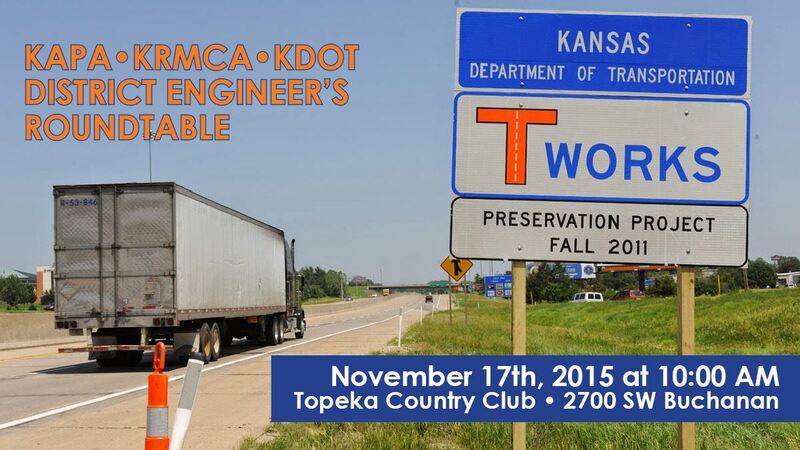 Lunch will be served at the Topeka Country Club for $25 per person. You must register whether or not you are eating lunch. Please Register/RSVP and send in your questions by Friday, November 13. For questions, Call KAPA-KRMCA at (785) 235-1188.